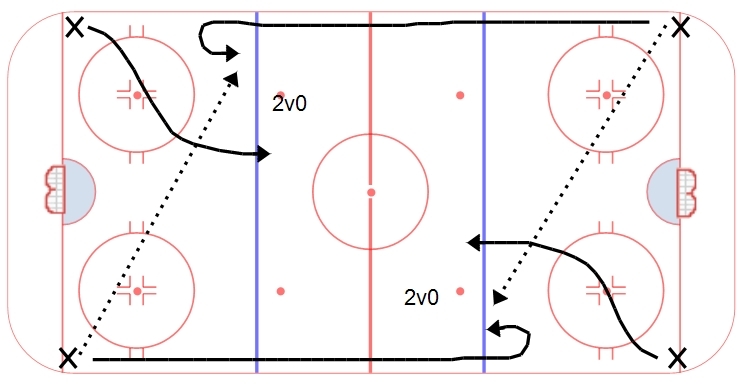 This week’s drill is a simple warmup/shooting drill that incorporates a lot of flow, timing and precision. Carolina Flow begins with lines in all four corners. One player takes off from opposite lines and button hooks just inside the far blue line. They receive a hard pass from the opposite line. Meanwhile, a player skates out of the same side and skates into a support position. They then attack the far net in a 2v0. As soon as the player makes the hard cross ice pass, they take off and button hook inside the far blue line. The drill is continuous. Players should focus on speed/pace of the drill, hard accurate passes, timing and support, driving the net, and shooting to score/shooting for rebounds.